With consumer confidence in November printing near the highest levels since the dot com bubble, it was almost inevitable that in light of the recent economic and market turmoil, the December print would disappoint, and sure enough it did just that, when the Conference Board reported the December print dropped from 136.4 to 128.1, missing expectations of 133.7 and the lowest level since July. While Americans' assessment of the Present Situation was almost unchanged, at 171.6 vs 172.7 in November, it was their outlook that took a hit, as the Expectations Index tumbled from 112.3 to a two year low of 99.1, a 13.2 drop which was the biggest since August 2011 when the US credit rating was downgraded by the S&P and the S&P nearly fell in a bear market, dropping 19% before rebounding. One possible reason for the collapse is Americans' take on the job market which appears to have reversed abruptly, with those expecting more jobs in the months ahead falling to 16.6% from 22.7%, with the 6.1% pt drop is the biggest in over 41 years. 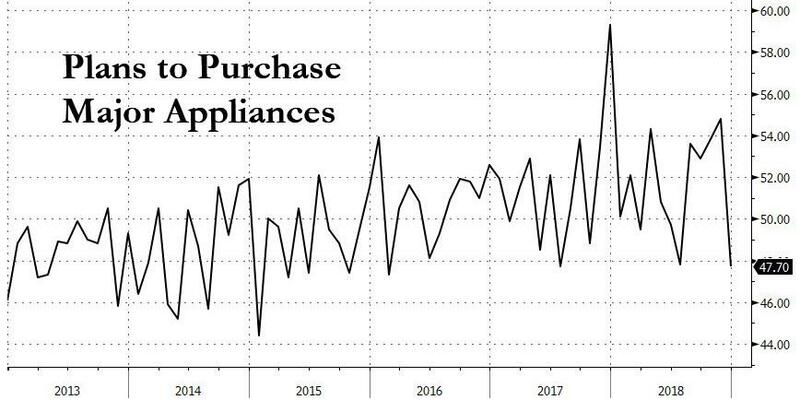 This sharp drop in confidence about the labor market also resulted in a plunge in plans to purchase major appliances, which hit a level not seen since February 2016, hit during the E&P crisis when many note the US was hammered by a manufacturing recession. Commenting on the unexpectedly poor number, Lynn Franco, Senior Director of Economic Indicators at The Conference Board. said "consumer Confidence decreased in December, following a moderate decline in November." 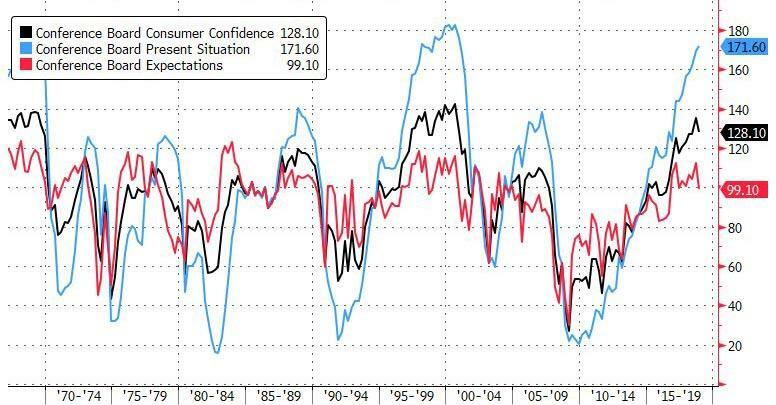 While looking ahead US consumer turned sharply more bearish, they are still optimistic on their current conditions even as the percentage of consumers saying business conditions are “good” decreased from 42.0 percent to 37.2 percent, while those claiming business conditions are “bad” increased from 10.7 percent to 11.3 percent. Consumers’ assessment of the labor market was mixed. Those claiming jobs are “plentiful” decreased marginally from 46.8 percent to 46.2 percent, while those claiming jobs are “hard to get” declined from 12.6 percent to 11.6 percent. Consumers’ outlook for the labor market was also less favorable. The proportion expecting more jobs in the months ahead decreased from 22.7 percent to 16.6 percent, while those anticipating fewer jobs increased, from 11.2 percent to 14.4 percent. Regarding their short-term income prospects, the percentage of consumers expecting an improvement declined from 23.2 percent to 22.4 percent, while the proportion expecting a decrease rose, from 7.2 percent to 7.7 percent. 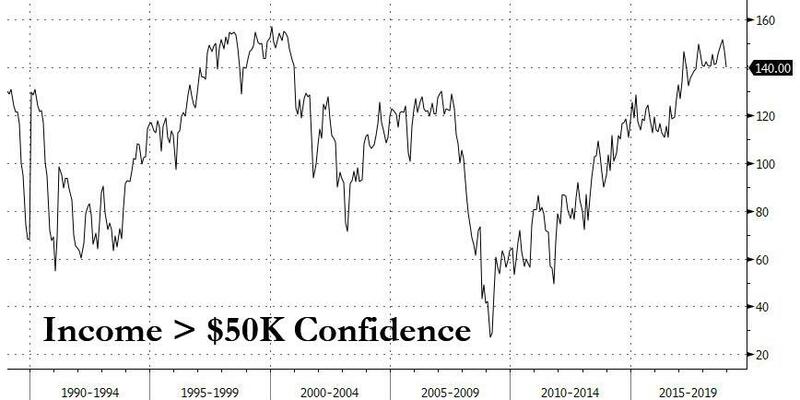 Of note, the richest Americans, those whose incomes are higher than $50,000 saw their confidence tumble from an 18 year high in October to the lowest level since Sept. 2017 in December. 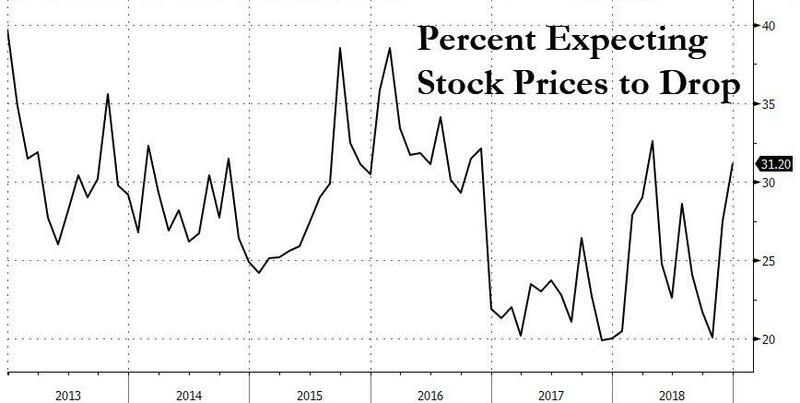 One possible reason: the number of Americans expecting stocks to drop has surged in the past two months to the highest level since April 2018. And yet the poor data presented above makes little sense because in light of yesterday's spending news, it would appear that Americans somehow spent the most money on holiday shopping on record in the month when their outlooks on the economy collapsed and fears about job prospects surged the most on record? In retrospect, it all makes sense.